Sarah's Reviews: Titles for the Last Three Dresden Files (potentially numbers 21, 22 & 23), A Handful of Hints, and Dresden Spinoff? I'll update as I find more details! So we know the plan, according to Jim's personal website, is to write 20ish case file books and then finish off the series with an apocalyptic trilogy. This puts us at 23ish books and we'll see how close it actually pans out. Skin Game was the 15th case file book and Peace Talks will be number 16. But what has Jim revealed about those final three books? "Oh, have an adventure that happens elsewhere other than the United States? Probably. It probably won't happen till the big trilogy and that will be, I mean the big trilogy at the end, you know about that right? Okay, the end is going to be the big apocalyptic trilogy and there's going to be all sorts of things happening and we're going to wind up all over the place. Because I've been planning for that for a while so I'm saving the epic stuff for the end. That's not for a while, that's- we've got-let's see, I'm on book, the next book will be sixteen, is that right? So we've still got sixteen, seventeen, eighteen, nineteen, twenty and then the big trilogy. And those will be like two books long probably, big ol door stop, hit-someone-over-the-head-with-it books. So, but you know it will require some patience on your part because the stories get, they don't, you make a story twice as long it doesn't get twice as hard - it gets like seven or eight times as hard to make it good. So, you know, the longer the story is the more work has to go in ahead of time, the more work has to go in to making it readable." During the B&N Q&A on October 1st 2015 Jim was asked when we are going to see dragons again. "Dude, I can't possibly do a dragon thing unless it's a whole book. So that would be book 20 or 21, something like that. Probably 21. I think 21. Yeah, that seems about right." "Probably not till the big trilogy at the end because wizards don't like to go on the Ocean. They don't do it unless they're desperate." May 2014 during a Q&A at Wyrd Con 5 an audience member asked, "Are we going to meet Jade Court Vampires anytime soon?" Jim replied, "No. No time soon and maybe no time at all. Being as they are very isolationists. You might meet an agent at some point in the future. But they don't get involved in things unless it's absolutely world destroying. So not till, probably not till the big trilogy . . . because there's degrees of destroying the world . 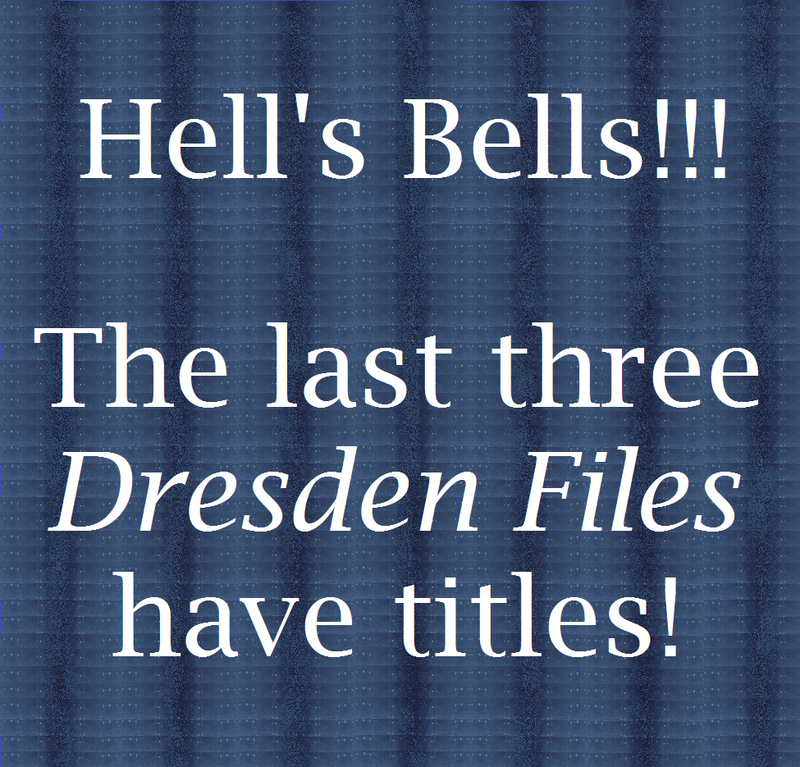 . ."
Jim also let the following Dresden Files teasers slip during WyrdCon 2013 - though please note that these are general series tidbits. Federal Authorities / Spooks have already appeared in the series unnoticed, have been responsible for some unexplained events, and will appear in future books. The Devil will make an appearance. There is so much here to speculate about, but my big question is, "Did the spooks attack Harry in Proven Guilty" Don't remember what I'm talking about, check out the Proven Guilty Summary and pay special attention to the road rage incident at the beginning and Ebenezar at the end. Also I don't recall that we ever got a 100% definite answer about who blew up Murphy's car in White Night (see the summary)? #2 A Dresden Spinoff, say what? In the below video Jim also says "I am not immune to commercial concerns and there might always need to be a spin off." I don't know if it will ever need to happen, but at this point if there was a spin off, I would definitely read it!